In fall 2013, the Palestine Awareness Coalition posted four maps on Vancouver`s TransLink buses and SkyTrain stations entitled Disappearing Palestine. This ad campaign received wide attention & media coverage at both the provincial & national levels. The Zionist organization StandWithUs attacked the maps and the Coalition, called on Advertising Standards Canada (ASC) to remove the ads &, together with other Israel lobby groups, threatened to take the Coalition & TransLink, Vancouver’s public transportation authority, to court. When threats did not work, StandWithUs ended up initiating a counter ad featuring three maps. 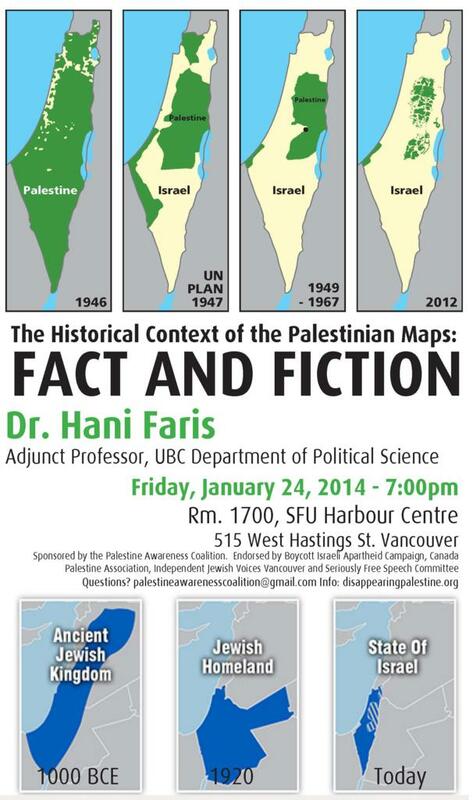 Dr. Hani Faris, Adjunct Professor in the Department of Political Science at the University of British Columbia, President of the independent American think tank Trans Arab Research Institute (TARI), and internationally recognized expert on the Palestine-Israel conflict will comment on the historical context of the maps. This entry was posted in SFSC and tagged audio-video, SFSC Event, translink ads. Bookmark the permalink.